In 2007 the Marvel superhero team The Fantastic Four hit theaters in the biggest sequel event of the year: FANTASTIC FOUR: Rise of the Silver Surfer. From that film comes THE THING, the next in the Fine Art Bust line in The Kotobukiya Collection – immaculately detailed cold cast porcelain recreations of your favorite Marvel characters. 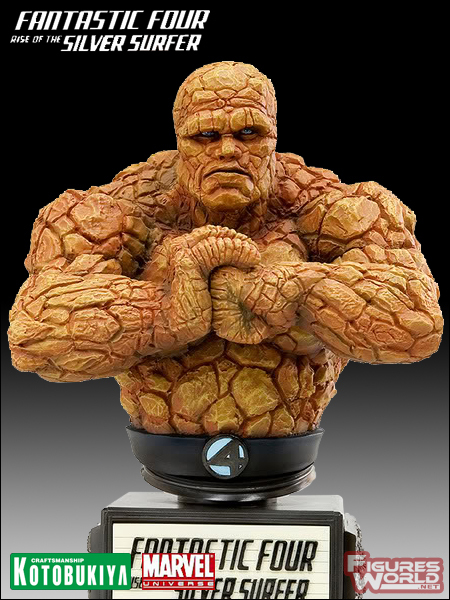 In 1/6th scale with all of the other Fine Art Busts, the mighty Thing is almost 10 inches tall. One of the astronauts aboard a fateful mission, Benjamin Grimm was bathed in space radiation that turned him into the orange rocky creature known as Thing. With great strength and durability Thing is a cornerstone of the Fantastic Four, both in the comic books and in the films, played by actor Michael Chiklis. 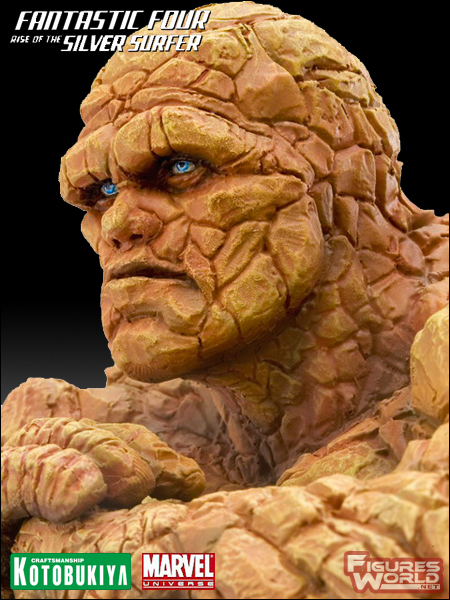 Sculpted by Shinichi Suzuki, Thing leans forward and cracks his knuckles, ready for “clobberin’ time.” The rocky texture of the hero’s skin is intricately detailed as only Kotobukiya can! 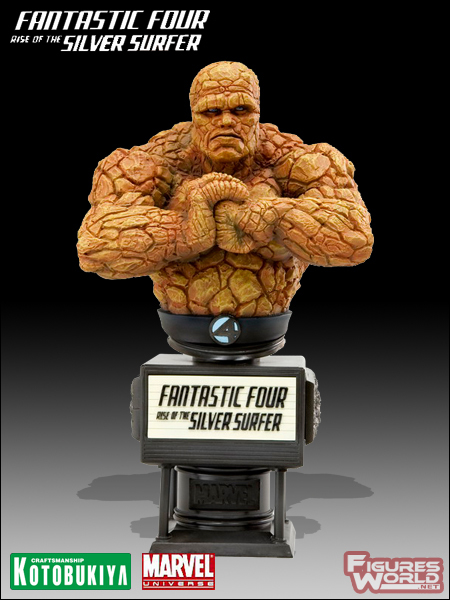 The Fine Art Bust of Thing features a deluxe marquee-style base with the Fantastic Four: Rise of the Silver Surfer logo that actually lights up! Furthermore, each bust in this Limited Edition has a hand written serial number on the back of the base. © Marvel, The Fantastic Four and all related characters: TM & © 2008 Marvel Characters, Inc. All rights reserved. www.marvel.com. The Fantastic Four: Rise of the Silver Surfer, the movie: © 2007 Twentieth Century Fox Film Corporation. All rights reserved.